Find the Ninja Battle boost function on each vehicle, press the back of the shell to reveal the exclusive and highly detailed Raphael figure or launch the exclusive foot soldier off the Dragon Chopper and into battle at the touch of a button. 1 supplied. Styles may vary. Please search code 125413 to check stock availability in our stores. 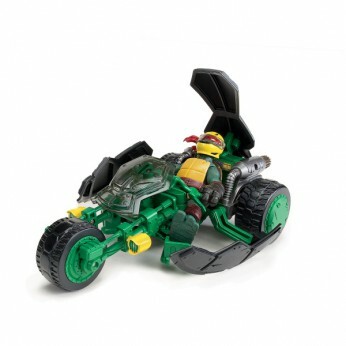 This toy costs approximately £19.99 (for the latest and best prices make sure you check our retailer list for the Turtles Stealth Bike and Exclusive Raphael Figure above). In our review of Turtles Stealth Bike and Exclusive Raphael Figure we classed it as being suitable for ages 3 years, 4 years, 5 years but recommend you check the manufacturer specific advice before purchasing.